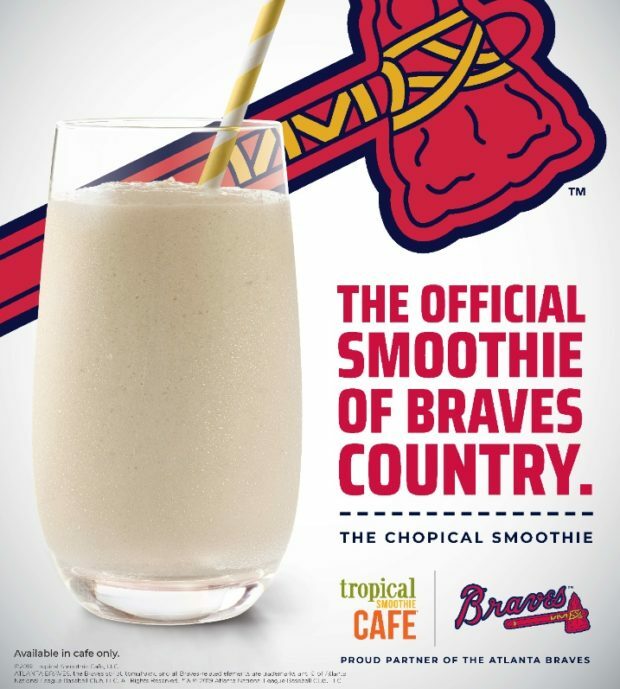 Braves fans can show support of their favorite team and cool off with a refreshing smoothie at the same time. Tropical Smoothie Cafe, a national fast-casual cafe concept known for both its better-for-you food options and smoothies with a tropical twist, today announced a multi-year partnership with the Atlanta Braves. Tropical Smoothie Cafe is celebrating the partnership by launching an Atlanta Braves-themed smoothie, the Chopical Smoothie, available starting today in the Atlanta area. Named after the baseball team’s campaign “Chop On,” the Chopical Smoothie is made with banana, coconut, pineapple and lemonade. The special smoothie is available all season long at participating locations in the Atlanta area every day at regular price and just $3 on Tropical Tuesdays. Morning, noon and night, a smoothie is a great way to refresh and get an energy boost. Now Braves fans have this unique opportunity. For more information about Tropical Smoothie Cafe, please visit https://www.tropicalsmoothiecafe.com.